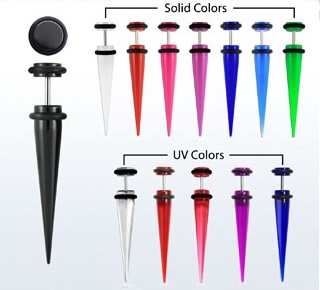 Acrylic earring designed to look like a stretched ear taper, with surgical steel bar. Available in 5mm, 6mm or 8mm sizes and in a range of colours, including a range of UV reactive colours that glow bright under ultra violet lighting. Available as a single earring for £3.50 or a pair for £6.00. Note: This earring is for a pierced ear. It is not magnetic.